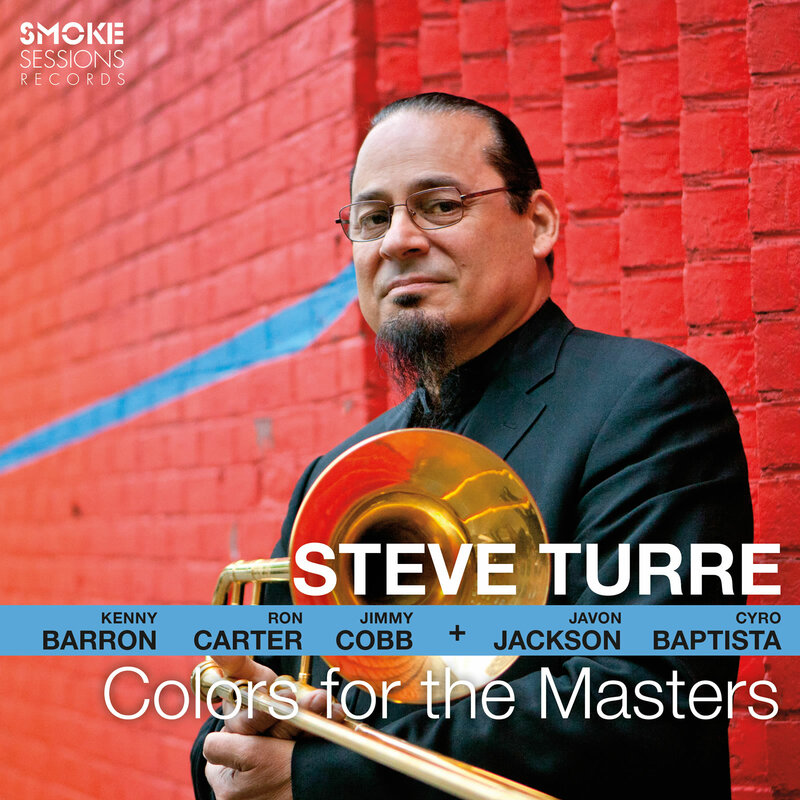 Colors for the Masters, due out August 26 on Smoke Sessions Records, teams Turre with a rhythm section of legendary elders, each of whom shaped the trombonist’s distinctive voice: pianist Kenny Barron, bassist Ron Carter and drummer Jimmy Cobb. On four tunes the band is joined by saxophonist Javon Jackson, like Turre an alumni of Art Blakey’s Jazz Messengers; and for the album’s final tune, a stirring rendition of Jobim’s “Corcovado” on which Turre shows off his innovative shell playing, virtuoso percussionist Cyro Baptista also joins in. Together, they pay electrifying homage to other, departed luminaries like John Coltrane, J.J. Johnson, and Thelonious Monk. The opportunity for expressiveness that Turre was searching for is seized through Cobb’s whispering, delicate brushwork on Monk’s “Reflections”—on which Turre shows off his Harmon mute in a beautiful solo—as well as on the full-throttle swing and brisk, rapid-fire soloing he unleashes on J.J. Johnson’s “Coffee Pot.” You can hear it in Jackson’s fluid, cascading lines on “JoCo Blue,” a simmering blues that Turre wrote in tribute to the great John Coltrane. While he modestly deflects praise onto his collaborators for the session, Turre himself has long been lauded as one of the modern champions of his instrument, whether accompanying Rahsaan Roland Kirk, Woody Shaw and Lester Bowie or playing between the laughs through his 30-plus year stint as part of the Saturday Night Live band. On this album he pays homage to one of his idols, J.J. Johnson (“to the trombone what Charlie Parker is to the saxophone”) and shows off his own wide-ranging virtuosity and depth of feeling, wringing touching melodicism from “When Sunny Gets Blue,” navigating intricate modal playing on the title track, or spinning off darting, barbed licks on “United” — a song he recorded with Woody Shaw, but without the solo spot he typically had on live dates. Then there’s the conch shells, the instrument that Turre calls “the most ancient of horns” and that he single-handedly introduced to the jazz idiom. He shows off his ability to moan the blues on the seashells on Jobim’s classic “Corcovado” to close the album — even playing two shells at once, echoing the show- stopping antics of his earliest mentor, Rahsaan Roland Kirk. “Colors of the Masters” was recorded live in New York at Sear Sound’s Studio A on a Neve 8038 custom console at 96KHz/24bit and mixed to 1⁄2″ analog tape using a Studer mastering deck. Available in audiophile HD format.